The earliest records for Bethlehem Rural Cemetery (Elmwood Cemetery) date from 1860, and include early burials from the original graveyard of the First Reformed Church of Bethlehem. Early family plots contain names which are rich in Bethlehem town history. 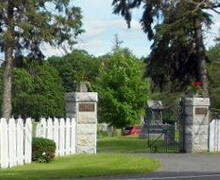 The Cemetery is governed by the Bethlehem Rural Cemetery Association.